Today is the day before April. I've blogged several times about this favorite poem of my childhood by Mary Carolyn Davies. My mother, my sister, and I have long celebrated "the day before April" as a special Mills family holiday. I always think of them both on this day, although my mother is no longer living. My sister sent me a "Day Before April" email greeting before dawn this morning. elsewhere, but I usually was able to find something. particular day, too. Hooray for the power of poetry! I have spent my whole adult life simultaneously pursuing three different careers: 1) children's book author; 2) children's literature scholar; and 3) philosopher professor specializing in teaching and writing about ethics. 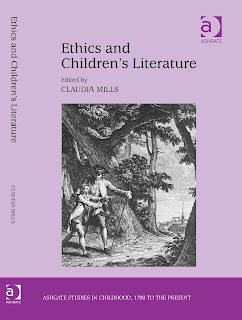 The older I got, the more the three began to converge: I used children's literature examples in my Intro to Ethics class; I published scholarly articles about ethical themes in children's literature; I gave my fictional characters ethical challenges to face. When I came to the Prindle Institute for Ethics at DePauw University in the fall of 2011, my three professional loves finally melded into one. I taught a course on my beloved Jean-Jacques Rousseau (himself a novelist and theorist of childhood) for the Philosophy Department, but also taught children's literature (for the first time in my life) for the English Department. I organized a symposium on Ethics and Children's Literature, where philosophers, children's literature scholars, and children's book authors came together for three idyllic days, sharing our papers and talking in the beautiful setting of the Prindle Institute. 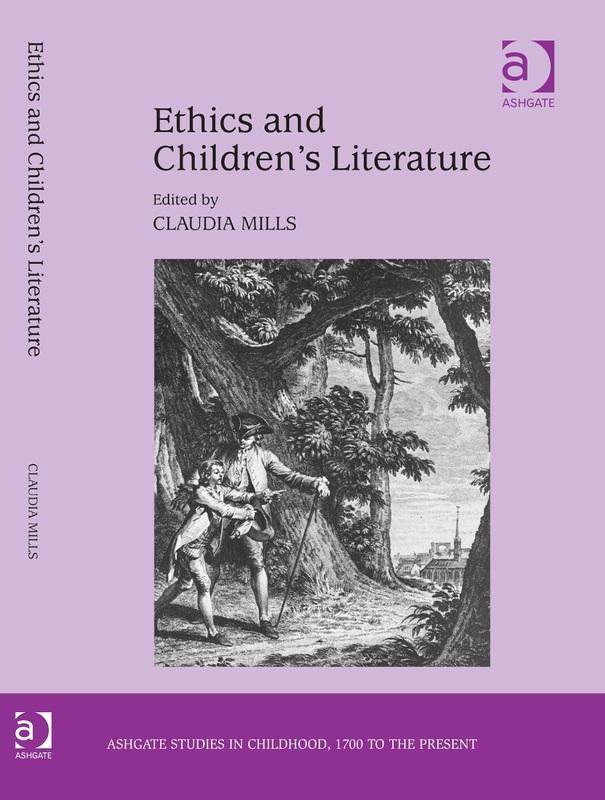 From that symposium grew a book, Ethics and Children's Literature, under the encouragement of brilliant editor Ann Donahue at Ashgate Press, who published it in Ashgate's "Studies in Childhood, 1700 to the Present" series. (The cover image is an illustration from an early edition of Rousseau's Emile.) Making the book was a labor of love, for it is a tangible representation of the union of my three careers, brought together in one volume. This week I learned that the book just won the Children's Literature Association's Edited Book Award for an "outstanding edited collection of essays in children's literature, history, and criticism," selected from a field of almost forty titles published in 2014. Earlier I also learned that one of the chapters in the book, "The Rights and Wrongs of Anthropomorphism in Pictures Books," by Lisa Rowe Fraustino, won the Children's Literature Association's Article Award for the best scholarly article published in 2014. Lisa is my dear, dear friend, and now she and I will sit together at the awards banquet at the June conference, held this year in Columbus, Ohio. Few things in my life have made me happier than this recognition, from peers I respect, eminent scholars in a field of study to which I have blissfully devoted the past two and a half decades of my life. I think of Marmee's final line at the end of Little Women: "Oh, my girls, however long you may live, I never can wish you a greater happiness than this!" I'm sure other happiness, and sorrow, will come my way. But this is a week I'm going to remember with great fondness for the rest of my days. One day this week, here at little DePauw University in tiny Greencastle, Indiana, I attended not one, not two, not three, but FOUR talks (in addition to teaching a class on Harry Potter in my children's literature course and a class on climate change refugees in my ethics of immigration policy course). 11:30-12:30 Luncheon talk on narrative medicine with Dr. Owen Lewis, professor of psychiatry at Columbia University. "Narrative medicine" makes use of writing about illness by physicians, patients, and family members to deepen understanding and promote healing. Lewis read aloud a piece of writing by one of his medical students about the day she "met" her cadaver; in the piece the writer notes the red nail polish on the fingernails of the woman whose corpse she is going to be dissecting and wonders about the circumstances that led her to apply it with such care. 4:00-4:45 Craft talk on songwriting by young singer/songwriter (and DePauw graduate) David McMillan of the indie band Fort Frances. Here is the best advice he ever received in his writing/performing career: "Your last album was great! Don't ever do anything like it again! "A stimulating call for constant creative self-invention. 7:00-8:00 Talk by Buzzfeed journalist Anne Helen Petersen: "Too Loud, Too Fat, Too Slutty: The Rise and Reign of the Unruly Woman." This one was absolutely packed with students who wanted to hear a media analyst talk about the dominance of a new kind of female celebrity, a woman who defies (but sometimes also reinforces) cultural norms by being transgressively "too much" of something. I had never heard of any of the figures she was discussing - Lena Dunham, Amy Schumer, the characters of a raunchy TV show called "Broad City" (where apparently Hillary Clinton is set to make an appearance!) - but it was fascinating to get this glimpse into pop culture. 8:00-9:30 Talk by theologian Candida Moss of Notre Dame on the topic of "Heavenly Bodies: Disability, Infertility, and Bodily Values in Early Christianity. "The talk explored the early Christian church's attempt to understand resurrection of the body, which necessitated speculation about what resurrected bodies might be like. Presumably we wouldn't get our same, decrepit-at-death bodies back post-Resurrection, but some idealized form of our bodily selves. But idealized, how? Moss examined the ways in which the early church constructed a vision of idealized bodies that implicitly denigrated bodies that were black, female, or disabled. Okay, this wasn't really a typical day for me here at DePauw. Even as someone who tries to go to just about everything that is intellectually and creatively rich and stimulating, I broke my own record for talks attended in one twelve-hour period. But it was an amazing day. Will I ever again hear talks about fingernail polish on a corpse, songwriting advice, celebrity gossip, and speculations about the nature of Christian resurrection, all in one day? This is the week my children's literature students have looked forward to since the start of the semester almost seven weeks ago: our three classes discussing the best-loved text of their childhood, Harry Potter. We're situating the series within the genre of the British boarding school story, which first began with Tom Brown's School Days by Thomas Hughes, published in 1857 - a book that featured life at a boarding school (the actual, real-life school of Rugby), with competition between houses to excel at a relatively novel sport (guess which one?) under the guidance of a charismatic headmaster. We're also analyzing striking parallels between the opening of Harry Potter and the Sorcerer's Stone and the opening of Peter Pan, with the Darlings and the Dursleys both obsessed with respectability before some magical force "breaks through" into their humdrum reality. We're talking about Harry Potter as a Cinderella story with one student also uncovering similarities between Harry Potter and Snow White. And we're seeking to understand the series' unprecedented worldwide popularity. As part of our foray into the universe of Harry Potter fandom, we all trotted home after Monday's class to get ourselves sorted into Hogwarts houses on the Pottermore website, which the most die-hard fans among us declared to be the best. I had never done this before, confident that I would be placed in Ravenclaw, "where those of wit and learning will always find their kind." After all, young Rebecca who came with us on our Winter Term Enchanted Spaces trip had assured me I was definitely a Ravenclaw, because I'm so smart and creative (thank you, Rebecca!). But when I took the Pottermore Sorting Hat quiz, the hat did not place me in Ravenclaw. It did not place me in Hufflepuff, although I consider myself to be loyal and true. I doubted it would place me in Gryffindor because I'm not particularly brave of heart, and sure enough, it didn't. The Sorting Hat placed me in Slytherin. I couldn't believe it. So I scurried over to a competing Potter fandom website and took a different quiz for my house placement. I took a third quiz on a third website and finally, FINALLY, got Ravenclaw, but I have to admit I didn't give the answers that first popped into my head, but strained to find the ones that seemed most Ravenclaw-ish. Worse, when I confessed my result to the students today, several of them said that they could "totally see it"! Now, I was comforted by noting a number of other Slytherins in the class. Indeed, we seemed pretty evenly sorted, with perhaps a small edge for Ravenclaw and a slight paucity of Gryffindors. And my fellow Slytherins don't seem at all like Draco Malfoy and his thuggish sidekicks, or like greasy Snape, or the dazzlingly evil Voldemort. I've been rethinking the quiz questions all day. What made the Sorting Hat choose as it did? What question most marked me? I think perhaps it was my answering that I wanted to be thought "original," when I could have answered "intelligent" (thereby sending me to Ravenclaw?). I've never sought power, or at least I don't think I have, but I've coveted fame, as a writer, panting after starred reviews and placement on "best of year" lists. I don't think I've ever done anything untoward to secure these accolades, and goodness knows, I've secured very few of them. But I've yearned for glory, I know I have. 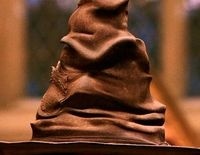 Oh, Sorting Hat, do you know me better than I know myself? I have to admit I'm taking this quite hard, pondering my entire life in light of two verdicts from a series of half a dozen multiple choice questions on two fandom websites. Today is my least favorite day of the year: the day we change the clocks for Daylight Savings Time. And this least favorite day of the year is my MOST least favorite in Indiana. Non-Hoosier friends may not know (I didn't know until I moved here) that Indiana is not on Central Time, as right-minded people would expect, but on Eastern Time. That is to say, we are in the wrong time zone. Here in Greencastle, on the western edge of the state, we're pretty much due south of Chicago, which is on Central Time. We're actually farther west than Nashville, which is on Central Time. It is dark here in the mornings. As in: dark. It's also cloudy here much of the time, so even when the sun does rise, the morning isn't what you could call bright and sunny. 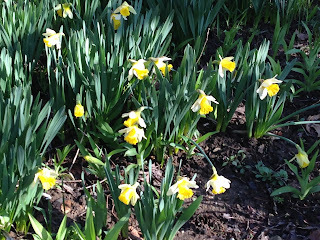 Each day as spring approaches, and it's a little bit lighter in the morning, my heart rejoices. I feel the same joy from the morning's paler sky that I feel when I see crocuses pushing their way through last year's dead leaves or daffodils beginning to open their tightly furled golden flowers. Spring is on its way! Except that I know that horrid day is coming, when we change the clocks ahead one hour, losing not only one sweet precious hour of our lives which we won't regain until the fall, but everything we gained from all those lightening mornings. It's dark in the morning all over again. How dark? This morning - I looked this up - the sun rose here at 8:01.Yes, the sun doesn't rise here until after eight o'clock! The only consolation I can offer myself is that at least now the worst has happened, we've lost that cherished hour of morning light, so from now on, every day will really be another day of progress, genuine promise, with a minute more of light each morning. And this time not light that will snatched away by some cruel clock-shifters, but light that we can keep for good. It's sort of how I actually look forward to finding out the terrible financial hit I'll take on taxes (always around this same time of year). I might as well find out the worst, face it whatever it is, pay it whatever it costs, and then start saving all over again. So it's heartbreakingly dark this morning. But it will be lighter tomorrow, and lighter still the day after that. The dogwood will bloom. Easter will come with its hallelujah of resurrection. I wanted a teaching challenge for myself this spring, and I got one: I'm teaching a new course that I've never taught before, a course for the DePauw Philosophy Department on the Ethics of Immigration Policy. I wanted to teach it because the topic couldn't be more timely and urgent, with the heated presidential election rhetoric as well as the heart-wrenching refugee crisis erupting every day in Europe. And I wanted to teach it because I don't think there are any easy answers here, philosophically, politically, or practically, and I prefer teaching courses that pose genuinely hard questions for my students - and for me. Well, that is definitely what I've gotten. This past week we've been talking about what our admissions priorities should be in a world of at least partially closed borders. Family reunification? Advancing our own national interest through recruiting highly skilled foreign workers to strengthen our economy? Compensating those harmed by wrongful U.S. governmental policies that rendered their native lands all but unlivable? Next week we'll begin looking closely at the category where admissions seem most clearly morally obligatory: refugees. Here are two things that are making the teaching of this course extra hard. 1) Each day brings new real-world developments I feel that the class - and I - should be keeping abreast of. To address this, I've instituted "Current Events Fridays" where teams of students present something from the news for our collective edification. 2) The issues we are discussing connect deeply with the actual lives of some of the students in the class. At least one student is a refugee: she told me her family came to the U.S. as refugees from Myanmar (Burma). Another student may be an undocumented migrant (a classmate told me this). 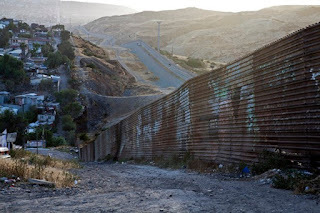 So when other students defend not-unreasonable views that support stringent limitations on immigration, these views are not just abstract philosophical ideas; they are views that impact the lives of real people -including real people in our own class. This latter challenge is tougher to deal with. I don't want to silence robust, wide-open debate where all respectfully presented views get a hearing. But I also don't want vulnerable students to feel unwelcome in our midst. So far the main thing I've done to address this situation is to have a guest lecturer to the class, a colleague who specializes in recent Central American history. 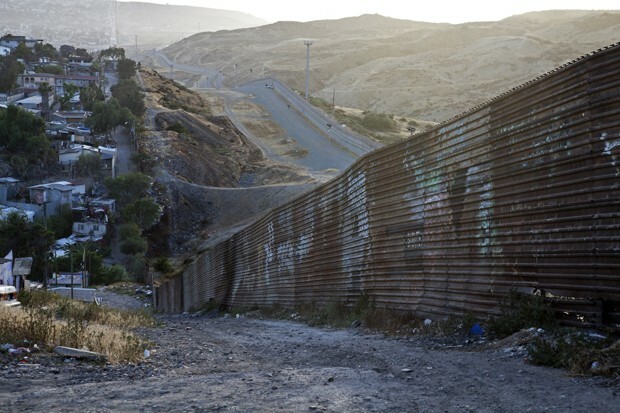 He shared a heart-breaking story about a former DePauw student who was an undocumented migrant, deported shortly after graduation: taken down to El Paso and walked across the border to Mexico, with nothing but the clothes he was wearing, this although he hadn't lived in Mexico since he was three years old. That student, Daniel, has now died, either from suicide or as a victim of gang violence. The students were visibly moved by this story. I was, too. I console myself by the thought that even if it's hard to balance competing factors in designing and teaching a course like this, at least I'm trying. It's better to create a space where we can learn about these enormously difficult issues than to avoid engagement with them altogether. It's better to educate ourselves, and to try to formulate reason-based arguments while also allowing ourselves to experience the emotion any decent human being would feel from a story like Daniel's. So that's what I'm doing this semester, each Monday, Wednesday, and Friday from 12:30-1:30.